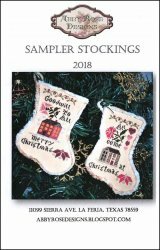 Sampler Stockings [E1373] - $9.00 : Yarn Tree, Your wholesale source for cross stitch supplies. Cross stitch pattern by Abby Rose Designs. Do you find yourself counting down to Christmas, but finding that your tree is missing a little something?!? The "Sampler Stockings" would be a perfect addition! The first stocking features "Goodwill to all. Merry Christmas," with a large two story home & snow covering the ground. The second stocking features "All come at Christmas," with a large white two-story home, with a wreath above the door. Hearts & a pink flower are stitched above the house. Stitch counts: Good Will To All 57W x 72L & All Hearts Come Home 59W x 72L.